Following the development of the German Lied after the nineteenth century - when it was widely known as the setting of Romantic poetry to music - this book explores the changing artistic scene in the early twentieth century, as rapid social, economic and environmental changes affected German cultural production. 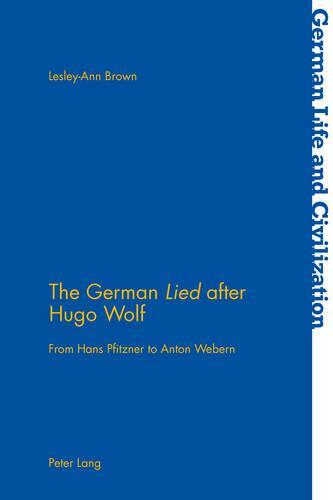 The Lied then faced not only a crisis of identity, but also a threat to its survival. This book considers the literary and musical ideas that both challenged and complemented each other as new directions in songwriting were developed across the modern period. The composers selected for their relevance in Lieder composition during this time illustrate not only the diversity of their musical thought but also a changing approach to the relationship between the poetic text and its musical counterpart. Hans Pfitzner represents the determination to maintain established tradition; subsequently, a chronological progression through the individuality of Paul Hindemith and social integrity of Hanns Eisler leads to the point where transformation of the genre can be said to have begun, with Arnold Schoenberg. With the Lieder of Alban Berg and Anton Webern, the genre arrived at a point of convergence with the ideals of German modernism. This study offers new insights into the cultural significance of German songwriting in the first part of the twentieth century.